Michelle Lally from Australian Micro Abattoirs accept the Producers Innovation Award from MLA Managing Director Richard Norton. Image supplied. A FARMER-DEVELOPED micro abattoir concept has been nationally recognised as an innovative system component for the meat market. 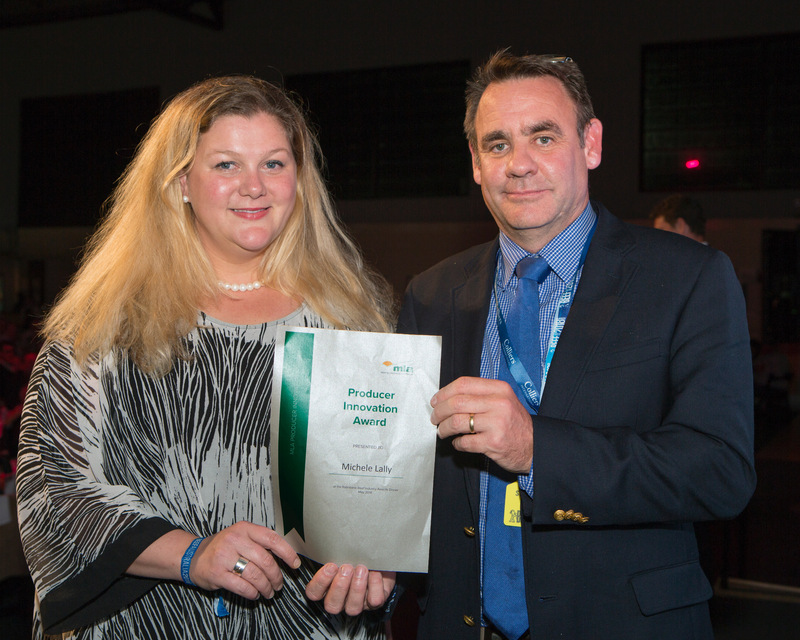 South Australian Michele Lally accepted the MLA Producers Innovation Award for Australian Micro Abattoirs at the Rabobank Beef Industry Awards in Rockhampton this month. With her husband Phil, Ms Lally started Savannah Lamb in 2009 – a small-scale producer of lamb with a focus on ethical, sustainable and stress free livestock handling methods. Despite strong customer demand for Savannah Lamb products, the issue of processing small numbers of animals became a major barrier for the brand. Using commercial-scale abattoirs consumed so much of their time, the Lallys spent up to four days per week on the road taking livestock to be slaughtered and butchered, as well as delivering stock to distributors and customers. As well as the time spent away from the farm, the outgoings associated with processing – freight, commission, yard fees, freight and condemnation losses – represented some of the biggest costs for the business, eating into their profit margin. In addition to the time and cost factors, there is a general risk the meat that producers receive back is not from the livestock that they delivered to the abattoir. ‘When a brand promotes food provenance as a key feature, they must be certain their product has integrity and authenticity, or it can damage their reputation’ said Ms Lally. ‘We had a good relationship with our abattoir and we had a good system in place so we were certain that our returned carcasses were the animals we’d produced, but we know many other producers who have not been able to guarantee their supply chain system integrity”. In response to the ongoing issues, the Lallys set about developing a pilot version of a micro abattoir on their own Clare Valley farm, quickly generating interest from other small-scale meat producers. Seeing the potential for a fully integrated micro abattoir product and service offering, Ms Lally started Australian Micro Abattoirs as a standalone enterprise. The ‘plug and play’ units are capable of processing both large and small animals, and are available with add-on features such as dry ageing capabilities, commercial kitchens and waste management facilities. With the ability to slaughter and process animals on-farm, Australian Micro Abattoirs hopes that farmers will be able to better manage output costs, product value and quality, throughput and animal welfare standards. ‘By building and installing small-scale abattoirs, meat producers can take control of their supply chain’. The service offered by the company comes with a full consultation program to match farmers with the right unit for their throughput, as well as additional consultancy services such as digital provenance, marketing and branding services and waste management advice. Australian Micro Abattoirs comes at a critical time for Australian livestock growers. An increasing number of medium-sized abattoirs have been forced to close due to low profitability, leaving few options for those with small numbers of animals. As well as providing a solution for paddock-to-plate growers, micro abattoirs offer a solution for small-scale livestock producers to band together into a cooperative arrangement, avoiding the need to transport livestock long distances prior to slaughter.